Native speakers of any language will judge the "difficulty" of another language by how much it differs from their own. For example, the Foreign Service Institute (FSI) of the U.S. Department of State lists five categories of increasing time taken for native English speakers to acquire "General Professional Proficiency" in other languages. This refers to an average, of course, and anyone may personally find one language or another more easy or difficult than others. FSI Category I (the least time needed) includes most of the Germanic and Romance languages, since English was originally a Germanic language that received a huge Romance input after the Normans turned up in Britain in 1066. The exception is German itself, which is alone in Category II (needing longer), because of its more complex grammar. Category V (the longest time needed for proficiency) consists of Arabic, Cantonese, Japanese, Korean and Mandarin, with Japanese being considered the most difficult. Most languages are in Category IV, including the rest of the Indo-European languages. The recognizably tougher ones in that group are the Uralic languages (Estonian, Finnish and Hungarian), because of their countless noun cases. Interestingly, Category III (easier than IV) consists of Indonesian, Malaysian and Swahili, which have no known historical connection to English — they just happen to have fewer linguistic differences than do the other languages. And that is the point of this post — linguistic similarities don't necessarily reflect the evolutionary history of the languages. There are trees allegedly showing the genealogy of languages, because there is vertical transfer of information in the history of languages (generation to generation), but horizontal transfer has also been a powerful evolutionary force, as cultures come in contact with each other. The history of English, as noted above, shows both vertical (Germanic) and horizontal (Romance) influences. Language history is a reticulating network, not an evolutionary tree. Just as importantly, though, languages can have coincidental similarities. There are, after all, not that many different ways of constructing a language, and there are reported to be ~6,900 distinct languages on this planet. So, chance similarities must abound — what in biology we would call parallelisms and convergences. This makes constructing the evolutionary history of languages difficult. The complexity created by coincidences has lead some people to wonder about how "unusual" any one language might be. This can be defined as how many of its characteristics occur commonly in other languages, and how many of them occur more rarely. The most unusual languages will be those that have lots of the rare features; and we might call them linguistic outliers. The Idibon blog has already had a look at this topic (The weirdest languages), and here I reconsider their data in the light of a phylogenetic network. 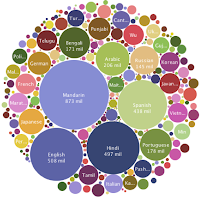 The original data come from the World Atlas of Language Structures, which describes itself as "a large database of structural (phonological, grammatical, lexical) properties of languages gathered by a team of 55 authors". 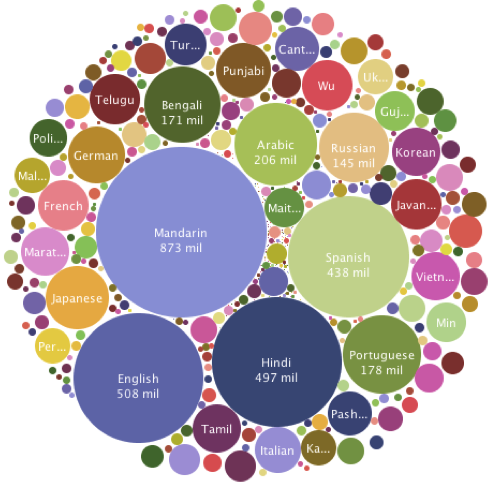 There are apparently 2,676 different languages in the database, coded for 192 linguistic features. Sadly, the database is very sparse, so that most languages have not yet been coded for most of the features (there are 5–1,519 languages coded for each feature). So, the Idibon people selected a subset of the data: 1,693 languages and 21 features. These features were chosen to be an uncorrelated subset of those 165 features that have at least 100 languages coded; and the selected languages each have at least 10 features coded. From the subset of languages, I chose all of those languages with at least 12 of these features coded, plus Icelandic (10 features), and Cornish and Gaelic(Scots) (11 features). I then tried to fill in some of the missing data, to get as many languages as easily possible up to having 14 features coded (ie. two-thirds of the features). For the phonology features (6A, 9A, 19A), the relevant information can be looked up on the web, particularly in Wikipedia and the Native American Language Net. For the word features (129A, 130A), I used the LEXILOGOS Online Translation. In the process, I found that Idibon has at least one feature mis-coded compared to the WALS web site: for feature 14A, some of the languages that should be coded "Second " have been coded as "Antepenultimate", and all of the others that should be coded "Second" have missing data. I also found a few contradictions between the WALS coding and the information elsewhere on the web. In some of these cases I re-coded the WALS data. My final spreadsheet is available online. There are 280 languages coded for at least 14 of the 21 features, compared to 239 such languages in the Idibon analysis. There are 19% of the data still missing, varying from 0–53% across the 21 features. My network is intended as an exploratory data analysis, rather than some attempt at an evolutionary diagram. Thus, the network simply displays the apparent similarity among the languages. That is, languages that are closely connected in the network are similar to each other based on their linguistic features, and those that are further apart are progressively more different from each other. First, I recoded the multivariate linguistic data as 59 binary characters. Then the similarity among the 280 languages was calculated for each pair of languages using the Gower similarity index, which can accommodate missing data (by ignoring features that are missing for each pairwise comparison). A Neighbor-net analysis was then used to display the between-language similarities as a phylogenetic network. The network is not very tree-like, is it? A few tentative groups can be recognized, as indicated by my colouring, but that is all. These groups do not correspond to any known language groups, meaning that the language features chosen do not reveal a traditional tree-like genealogy. Whether this reflects horizontal transfer of linguistic features, coincidence, or simply inadequate data, is not necessarily clear. However, it seems most likely that much of the complexity represents coincidence. In the study of language evolution, parallelism and convergence are not nuisances, which is the way they are treated when constructing phylogenies of organisms. Coincidental similarities are a fundamental part of language history, but they are not necessarily the product of processes like natural selection, as they often are in biology. Note that the seven Germanic languages are clustered in a single location, as are the two Baltic languages. The others appear in either two (Celtic, Romance, Iranian) or four (Indic, Slavic, Uralic) locations. This implies considerable linguistic variation within most of what are considered to be closely related languages (that is why they are called language genera). A larger collection of features might change the pattern, of course, but I still reckon that there is a large component of non-vertical transmission here. This is either coincidence or horizontal transmission. For the Indo-European languages, the latter is perhaps quite likely; but it is equally likely that it is simply coincidence, even at this relatively fine scale. The Idibon blog tried to reduce the multivariate data down to a single number for each language (scaled 0–1), representing its "weirdness" in terms of how many uncommon features it has. So, I have performed the same calculation for my expanded dataset. My results differ from those of the Idibon blog for two reasons: more languages, and more data for some of the languages. Some of my added languages make it to the top of the weirdness list, including Seri, Danish and Swedish; and some of the other languages considerably change their score — for example, Hebrew, Welsh, Portuguese and Chechen are now near top of the list, and Quechua, Basque, Saami and Cornish are no longer near bottom. All of the big changes are increases in weirdness, suggesting that the missing data are important for this calculation. English does have one really odd feature, though, which is the use of the sound "th" (which is part of feature 19A). There are two forms of this sound, voiced (as in "the") and unvoiced (as in "thing"). These sounds do not exist in most languages, and they are rare even among the other Indo-European languages. That is why you often hear non-native speakers say "dis" and "zis" instead of "this" — "th" is a sound that they have no experience making. Actually, the Indo-European languages are very diverse in their weirdness. Many of them are at the top of the list, but there are also some at the bottom, including Hindi which is dead last. Notably, three of the Romance languages are at the top (Spanish, Portuguese, French) and two are at the bottom (Romanian, Italian). This seems unlikely, given the overall similarity of Spanish and Italian, for example; and so it probably reflects the specific choice of linguistic features. So, this feature alone can potentially change Arabic from "normal" to "very weird", depending on how it is coded. Languages do not have a tree-like evolutionary history. Even the relatively small dataset presented here seems to show the influence of horizontal evolution. But, more importantly, we should not underestimate the coincidental occurrence of language features (parallelism and convergence). These have usually been treated as a nuisance in phylogenetic studies of organisms, but they are likely to be important for the study of languages. I have discussed this further in a previous post (False analogies between anthropology and biology). Did you feed you additions and corrections back into WALS, so that future researchers trying to work with the data there benefit from it? Thank you for making this dataset public and for all the useful amendments. I am trying to put together a study that looks at the rate of long-term English acquisition and its relationship with a "distance from English" variable, which I hope to define as the sum (or the average) of differences of individual, feature-specific indices for each language from those of English. Namely, the distance from English to Armenian is equal to the Sum (or average) of all differences between the individual features. Ignoring the problem of missing values for the time being, do you think this a reasonable way to measure such a distance? Do you know how the particular values are calculated, and what do they represent? I know Idibon is the original creator of the dataset, but they seem to have vanished into thin air. The "sum of all differences between the individual features" is called the Manhattan Distance. There are many, many such distances defined in the literature, and the Manhattan is as good as any of them. I often use it in this blog. However, the "problem of missing values" is a big one for most distances. The only practical solution appears to be to define a modified distance, which is what the Gower similarity does (the one I used in this post). The distance is recalculated as a percentage of the maximum possible distance for any pair of languages (the maximum being the sum of the non-missing features rather than the sum of all features). Idibon was a start-up company, and it (sadly) closed down when they could not get any further venture funding. The data coding for each feature is explained at the original data source, the World Atlas of Language Structures. Thank you for the prompt and informative reply!